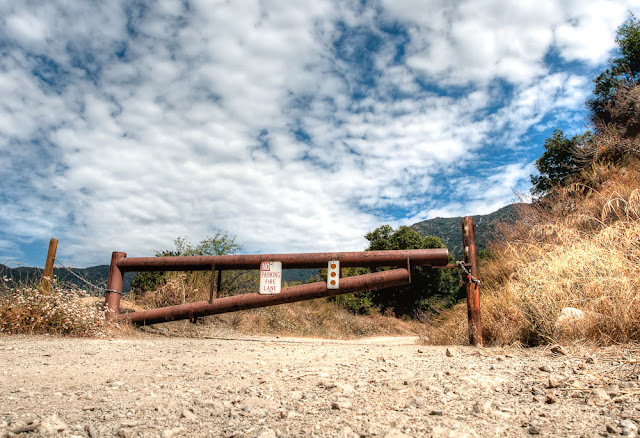 If you hike the Ben Overturff trail, you should recognize this gate. It's located at the first trail head. You can walk or take your bike around it to continue up the fire road, but it keeps people from driving beyond this point. Since there's no parking allowed and it isn't a public road up to here, you shouldn't be driving up here anyway. Gates like that bum me out just for the fact that if it didn't so thoroughly block the way, this could make a good wheelchair accessible trail. If memory serves, there's room on the right side with a little brush trimming. I wonder if anyone would be opposed to that? A power chair could do it or someone with strong arms or a strong pusher could do it in a manual chair. I maintain a list of local WC accessible trails (http://tinyurl.com/3ydq7fv) and there's so many more that can be made accessible with just a tiny fix at the entrance, like this one. There is a trail to the left I believe. IT is narrow, though. But if you are able, it is the better look.